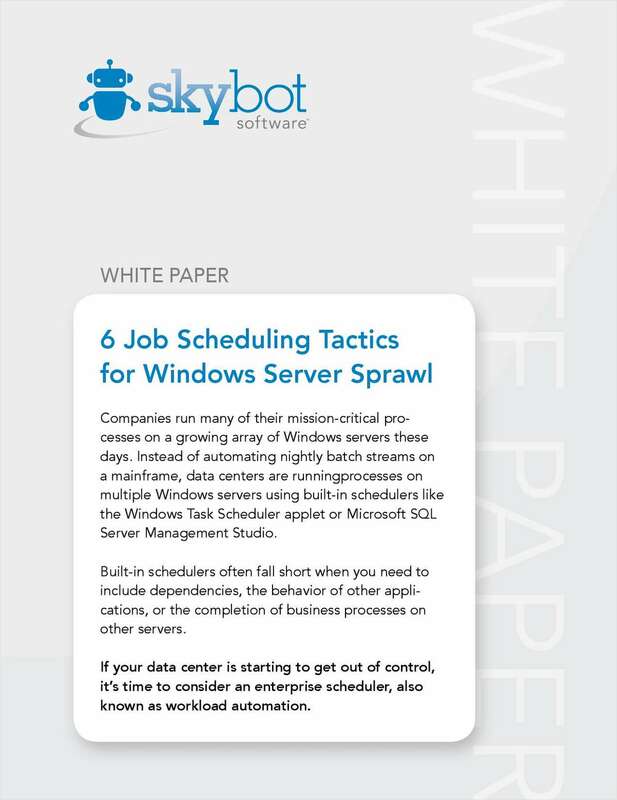 "6 Job Scheduling Tactics for Windows Server Sprawl"
Free White Paper: "6 Job Scheduling Tactics for Windows Server Sprawl"
Companies run many of their mission-critical processes on a growing array of Windows servers these days. Instead of automating nightly batch streams on a mainframe, data centers are running processes on multiple Windows servers using built-in schedulers like the Windows Task Scheduler applet or Microsoft SQL Server Management Studio. By submitting this content request, I have legitimate interest in the content and agree that Skybot Software, their partners, and the creators of any other content I have selected may contact me regarding news, products, and services that may be of interest to me.